Director Ron Howard (Willow) steps in for Phil Lord (Caroline in the City) & Christopher MIller (Clone High) to launch a prequel set in the Star Wars universe featuring Alden Ehrenreich (Stoker) as a young Han Solo. 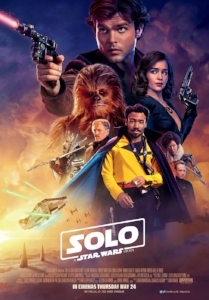 Featuring a great turn by Donald Glover (Diet Coke with Lime Ad) as Lando Calrissian, the film tries to pack in all nine things we know about Han Solo into one film. More or less, it transmits that information. Did you need this sequel? No. Will your enjoyment of any other Star Wars property be diminished if you miss it? No.